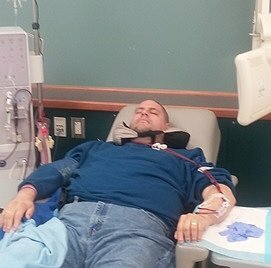 Louis Paone was diagnosed with ESRD (End Stage Renal Disease) in March 2014. The news was devastating but with the love and support of Louis’ wife Christine and his family and friends, he has remained strong and determined to get well again. Even though Louis attends dialysis treatments three times a week for six hours at a time, he still works on his non-dialysis days despite being legally disabled. The great news is that Louis has just recently been approved to get on the transplant list with one condition. In order for Louis to be fully approved, his medical facility has advised him that he will need to be prepared to pay for the high cost of out-of-pocket expenses that will not be covered by insurance during and post-transplantation. One of the biggest costs will be the anti-rejection medication Louis will need to keep his new kidney healthy. Anti-rejection and other necessary medications can easily exceed $2,500.00 per month. This will be a long process but Louis is ready for the challenge and ready to feel healthy again. For anyone who knows Louis, you know what a special person he is. He is always quick with a joke and a good word to make everyone smile. For those who do not know Louis personally, you will be helping not only a great person but his family and friends who love him so much and want to see him live a longer and happy life without the stress of worrying about how to pay for all of the upcoming out-of-pocket expenses. To help with the financial burden of Louis’s uninsured expenses, a fundraising campaign in his honor has been established with Help Hope Live, a trusted nonprofit organization that has been providing community-based fundraising guidance to patients and their families for more than 30 years. All donations are tax-deductible to the full extent allowed by law, are held by Help Hope Live in the South-Atlantic Transplant Fund, and are administered by Help Hope Live for transplant-related expenses only. Please consider making a contribution by clicking Donate Now. No donation is too small and all donations are very much appreciated. If you know anyone who may be willing to help Louis along this journey, please feel free to share this page and spread the word. Use any of the links on the right-hand side of this page under Share My Page: Facebook, Twitter, Google Plus, Pinterest, etc. You will be saving the life of a wonderful man who means so much to so many people. I would like to Thank all of the Con Ed Retirees for your support. I greatly appreciate it. i want let everyone know. I made the Transplant List. Thank you for your support. Thank you from the bottom of my heart to everyone who has donated. Please repost the ads. So it gives my page maximum visibility. Thank you so much to all those who have already donated! If you would be so kind as to sign the guest book and let me know who you are, I would greatly appreciate it as I want to personally thank you for your generosity. If you have donated anonymously, then I thank you very much, from the bottom of my heart. Good luck Louis, get well soon we are praying for you. Louis Mazza, Con Ed retiree. As a fellow Con Edison Retiree, I wish you all the best. Your Dad worked for me for many years in the Engineering Dept. I wish you the best in this long quest to regain your health. With all the Con Ed family pulling for you it will happen, so keep the faith. GOD BLESS and wishing you a full and speedy Recovery !! Worked at Con Ed For 30 years. My prayers are with you. Praying for you. My late husband Robert had 44 years with Con Ed. I worked with your Dad for many years at Con Ed. Our prayers are with you. Sorry I meant to say praying for you. From a con ed friend. Playing for you. Praying for your complete and miraculous healing ! Blessings to you and your Family ! Lou May God Bless Louis Paone and keep you in his care all the days of your life. My husband worked for Con Ed for many years and is since passed on. I believe in the gift of giving and that the people who work for the company are compassionate and caring of each other. We knew the struggle and were blessed with the care we needed. Not many are. So on behalf of myself and my husband I wish you all the best for a very speedy recovery. God Bless You and yours and I hope this will help your cause. Good Luck Louis! Stay Strong! Co Ed help each other. God bless you and heal you. you are in my prayers. Besides donating to a great cause all should consider signing up to be an organ donor and be an angel during your life or when the time comes. You, your family and the recipients family will be forever grateful. Wishing you well, Lou. Stay strong!!! Hey Lou. I hope the little I could give helps you on your way to feeling better and good health for many years to come. I wish I had the full amount you need, this wouldn't be an issue. Keep us posted on anything more we can do to help. Hello Louis, I pray that you reach your goal as soon as possible. Stay positive and best wishes. Hope you will reach your goal soon! We are thinking about you!!! Hang in there bud!!! Hey Lou, so sorry to hear you have to go through this. I hope you will reach your goal soon so you can get this taken care of asap. Wishing you all the best. So sorry to hear about your condition, but I'm grateful we reconnected so that I can provide at least a little support. Here's to better days ahead!